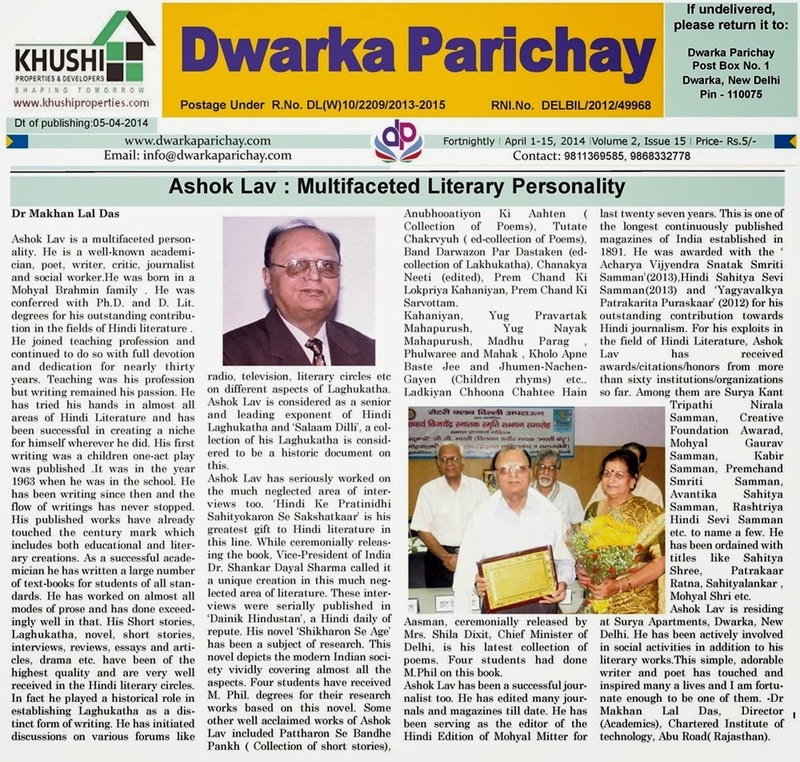 Ashok Lav is a multifaceted personality. He is a well-known academician, poet, writer, critic, journalist and social worker.He was born in a Mohyal Brahmin family . He was conferred with Ph.D. and D. Lit. degrees for his outstanding contribution in the fields of Hindi literature . He joined teaching profession and continued to do so with full devotion and dedication for nearly thirty years. Teaching was his profession but writing remained his passion. He has tried his hands in almost all areas of Hindi Literature and has been successful in creating a niche for himself wherever he did. His first writing was a children one-act play was published .It was in the year 1963 when he was in the school. He has been writing since then and the flow of writings has never stopped. His published works have already touched the century mark which includes both educational and literary creations. As a successful academician he has written a large number of text-books for students of all standards. He has worked on almost all modes of prose and has done exceedingly well in that. His Short stories, Laghukatha, novel, short stories, interviews, reviews, essays and articles, drama etc. have been of the highest quality and are very well received in the Hindi literary circles. In fact he played a historical role in establishing Laghukatha as a distinct form of writing. He has initiated discussions on various forums like radio, television, literary circles etc on different aspects of Laghukatha. Ashok Lav is considered as a senior and leading exponent of Hindi Laghukatha and ‘Salaam Dilli’, a collection of his Laghukatha is considered to be a historic document on this. Kahaniyan, Yug Pravartak Mahapurush, Yug Nayak Mahapurush, Madhu Parag , Phulwaree and Mahak , Kholo Apne Baste Jee and Jhumen-Nachen-Gayen (Children rhyms) etc.. Ladkiyan Chhoona Chahtee Hain Aasman, ceremonially released by Mrs. Shila Dixit, Chief Minister of Delhi, is his latest collection of poems. Four students had done M.Phil on this book. Ashok Lav has been a successful journalist too. He has edited many journals and magazines till date. 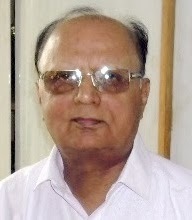 He has been serving as the editor of the Hindi Edition of Mohyal Mitter for last twenty seven years. This is one of the longest continuously published magazines of India established in 1891. He was awarded with the ‘ Acharya Vijyendra Snatak Smriti Samman’(2013),Hindi Sahitya Sevi Samman(2013) and ‘Yagyavalkya Patrakarita Puraskaar’ (2012) for his outstanding contribution towards Hindi journalism. 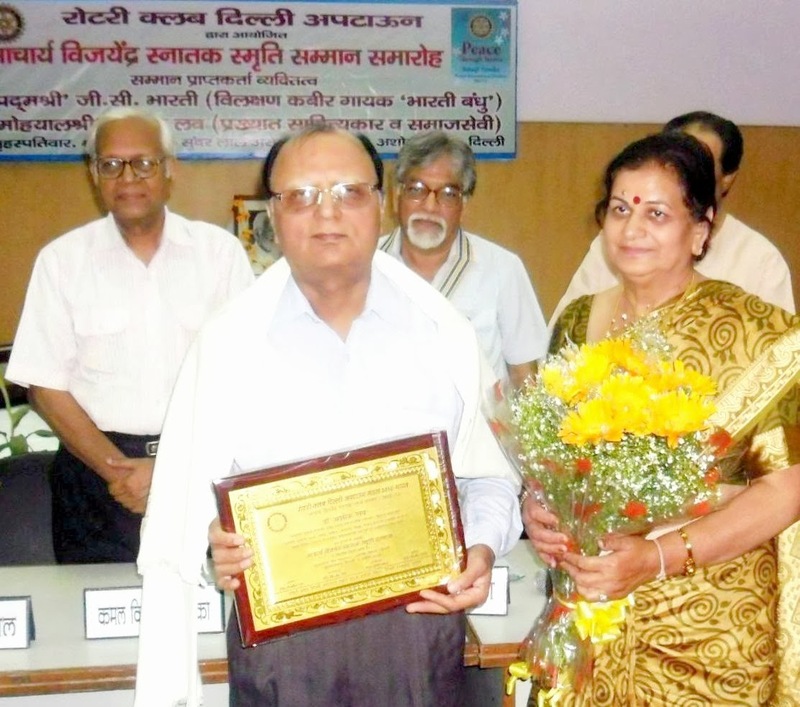 For his exploits in the field of Hindi Literature, Ashok Lav has received awards/citations/honors from more than sixty institutions/organizations so far. Among them are Surya Kant Tripathi Nirala Samman, Creative Foundation Awarad, Mohyal Gaurav Samman, Kabir Samman, Premchand Smriti Samman, Avantika Sahitya Samman, Rashtriya Hindi Sevi Samman etc. to name a few. He has been ordained with titles like Sahitya Shree, Patrakaar Ratna, Sahityalankar , Mohyal Shri etc. Ashok Lav is residing at Surya Apartments, Dwarka, New Delhi. He has been actively involved in social activities in addition to his literary works.This simple, adorable writer and poet has touched and inspired many a lives and I am fortunate enough to be one of them. -Dr Makhan Lal Das, Director (Academics), Chartered Institute of technology, Abu Road ( Rajasthan). Dwarka Baat Cheet: Secular Traditions in Islam Part-1 on 4th Sept.